Some work stories from Stan Weir, a socialist who worked a variety of manual labor jobs during the 1950s-1970s. Original version included 'Just A Matter of Gloves'. Zala hadn't lived many years in Los Angeles, but had been working in the warehouse longer than any of us. He was a good worker, the best. He didn’t drive his fork lift fast, but he was never behind and he helped us. He had highpiled all our stock in related tiers and knew the sequence by heart. After he began eating lunch with us, and without letting the boss know, he made drawings so that we could find the right stock by ourselves if he was absent or busy elsewhere in the warehouse. After coffee break one day the boss told him that he would have to give up the forklift job and go back to filling orders with a cut in pay. It turned out that the boss had a brother-in-law who needed a job. It can happen in a non-union shop. And then too, Zala didn’t have citizen’s papers or even an entry permit. He finished the day driving his lift almost recklessly, shuttling back and forth between the piles at top speed. That night as he punched out on the time clock he served notice that he was quitting ”as of now”. The next day was hell. None of the stock was in its accustomed place. We had to make three times the number of trips up and down an aisle of tiers to fill an order. We were very obviously running, but getting more and more behind all the time. The boss had a fit. When he started yelling at us we all told him that the new driver just didn't have what it took. No one mentioned Zala all day, or the next, or the next. By Friday there was still no improvement. We came in Monday morning and Zala was on the fork lift, rehired, and everything was piled so that the drawings he had made could be used again. They had paid him overtime to come in the day before and restore order. Twice each day, as stipulated in the union’s contract with the company, we got twelve minute relief periods - once during the first - and again during the second four hours of the shift. Utility men, in turns, would take over our jobs during these periods. The task was their principal and almost sole function. In every department of the factory the ratio between their number and the amount of men each of them was assigned to relieve was determined by dividing the relief minutes contractually allotted each worker into four hours. One or two workers were deducted from the quantity each utility man was assigned, depending on what portion (determined by time study) of his work day was consumed in travel from worker to worker. Moments after a shift began the utility man in our department would relieve the man who was the last to be relieved during the first four-hour period of the preceding day. It was the same in all departments. When that man returned the utility man moved several yards down the line to the second man, and so on, in rotation until all had a turn. The system was designed in such a way that the last man returned from his break as the lunch whistle blew. When production resumed after our forty-two minute lunch period, the process would start anew. But it was begun at a different place on the line in order to supply variety. The next day the second man relieved at the beginning of the previous day’s shift was first, and the man who was third on the first day was second. In eighteen days the cycle was completed and a repetition began the first man was first again. Thus each individual worker got his relief mid-morning or mid-afternoon once every eighteen days. Once on a swing shift my after-lunch relief turn fell in the last hour before quitting time. Nevertheless, I decided to escape my department for a good portion of my allotted minutes. I calculated that if I hurried I could reach a coke machine in the Trim Department that was a little over one hundred yards and a stairway away. Unlike the vending machine in our department, the Trim Line’s had root beer in it. I planned to begin my return trip immediately after extracting my drink from the machine, but at a more leisurely pace and on a different itinerary. I would consume my drink enroute. I reached the stairs, and halfway down I paused. From the landing I had a full view of a long section of the Trim Line. Below me the almost-finished products moved steadily along, shiny paint and chrome exteriors completed. The doors of each car were wide open and the interiors empty. The installation of dash panels and frames that hold the upholstered seats was in process. My attention was attracted by a foreman in a white shirt and black tie and two men in suits arguing with one of the line men. He was not working, he had refused to perform his operation on the car passing in front of him. The next man also refused to work on that particular car. Likewise the next man. And so it went, untouched, with the foreman and a growing number of supervisory personnel following and demanding that it be given its scheduled number of parts. I completed my descent of the stairs, ignored the soft drink machine, and followed the disputed vehicle at a safe distance. Every man confronted by both it and the men in suits (who now numbered almost a dozen) pointed at the center of the car’s floor and made essentially the same statement; “There’s nothing in the union contract and there’s no law that says I have to work in or around that condition." I moved in close enough to look inside, and a glance showed that someone back down the line had been unable to wait and had seriously, mountainously, and successfully relieved himself. A few more yards and refusals down the line, management realized how senseless it was to continue their demand. The point where the cars were completed and driven away to Inspection was only a short distance ahead, They called several utility men who followed the car to the end of the line and pushed it to one side, but the utility men also refused to conduct the necessary cleanup. One of the supervisors who had left the scene earlier returned with hose and bucket, found a water outlet, connected the hose and directed a hard stream at the target on the car's floor. One of his colleagues ran to the opposite side of the car. He tried to utilize one of the doors as ashield, extended the bucket as far from himself as possible and attempted to make it catch the cause of the dispute. The hastily organized cleanup crew and sympathizers exited. The man with the bucket at arm’s length led the column. The hose was left behind. 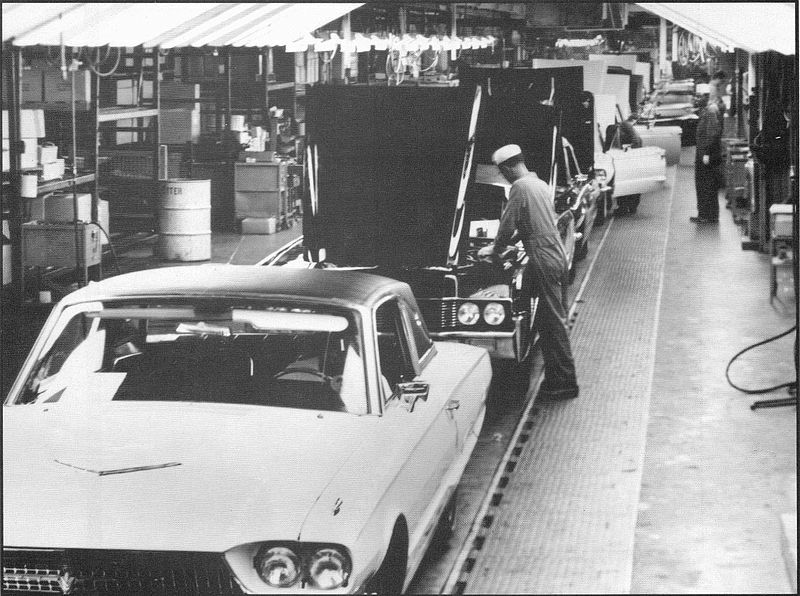 The car was eventually taken back to the point on the line where its assembly had been interrupted, and placed on the conveyor. Its completion was then resumed. Loud laughter was audible, but it did not come from any of the participants in the incident at those times when they could be seen. Straight faces were barely maintained when between cars, but once inside the next car the "crackups" took place, again and again. I ran all the way back to my department by the direct route. I was late, but quieted criticism of my tardiness by arranging to give up the first relief due me on the following day. When the story I had to tell became known, it more than made up for any hardship I had caused the men in my group. It wasn't often that our department had the benefit of an eyewitness report of an important event in another department, an event to be told and retold, several days antidote for monotony. And secretly, we envied the men down in Trim. They had been given an opportunity to make a decision.